A centralized facility handles hydraulic fracturing for several natural gas wells being drilled in the Parachute area by WPX Energy. 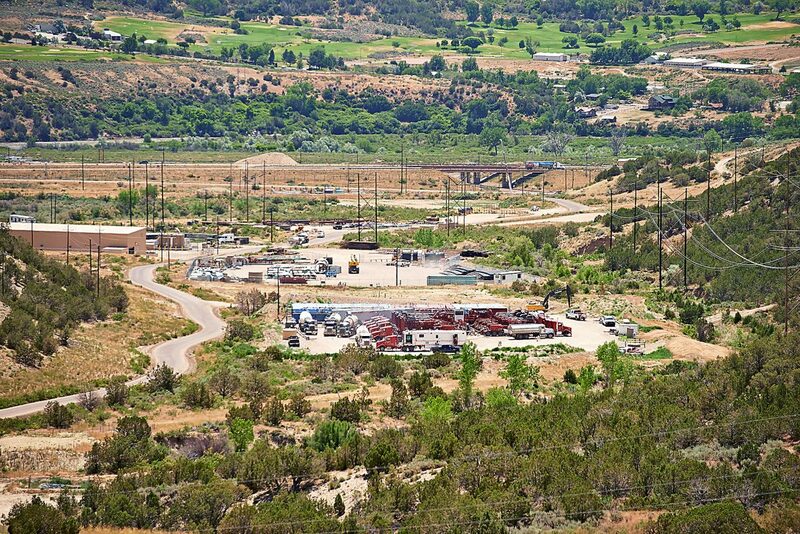 The site uses pipelines to send fracking fluids, sand and water to remote well sites. It's a way to reduce truck traffic and noise, according to WPX. Gov. John Hickenlooper said Monday at the Aspen Ideas Festival that he opposes proposed state ballot amendments that would cede control of oil and gas development to local jurisdictions. Hickenlooper told a standing-room-only audience at the Doerr Hosier Center that Colorado is the leader in the country in regulating the industry. It adopted the nation’s toughest regulations on air pollution earlier this year and limits the amount of methane that can be emitted during drilling and production. It worked with the industry to provide the public three years ago with information about the ingredients of fracking fluids, he said. The state also boosted fines for surface spills of fracking fluids from up to $1,000 to up to $10,000 per day. But the governor said he also wants to see the oil and gas industry thrive and expand in Colorado. “Our job is to make sure it’s done safely,” he said. What constitutes safe drilling is triggering a big battle in Colorado. Advocates for health and the environment are trying to get a number of measures on the November ballot that would amend the state constitution to either regulate the industry directly or provide more local control. Initiative 88 would increase the setback for oil and gas wells from the current 500 feet to 2,000 feet from occupied buildings. Initiative 92 would give counties and municipalities power to limit oil and gas development in their jurisdictions. All told, backers of 11 proposals are aiming for the November ballot. Hickenlooper tried to cobble together a compromise that would avoid a November showdown. That effort suffered a potentially fatal blow Friday when 19 oil and gas companies said they wouldn’t support compromise legislation. During an Aspen Ideas session titled, “Fracking: Is There a Fix to the Fight?” Hickenlooper said the battle over setbacks is a land-use issue. Residents of subdivisions adjacent to rural areas don’t want oil or gas wells next to them. They have “a right to be upset” with drilling activity in their backyards, he said. But surface and mineral rights are often separate in Colorado, and holders of mineral rights might have been counting on selling to fund their retirement, Hickenlooper noted. The drilling of gas wells can be done within eight to 10 days, so the disruption to the adjacent property owners is minimal, Hickenlooper told reporters after the session.